Numinous. That's basically what I felt when I first entered the Cathedral Basilica of St. Louis. 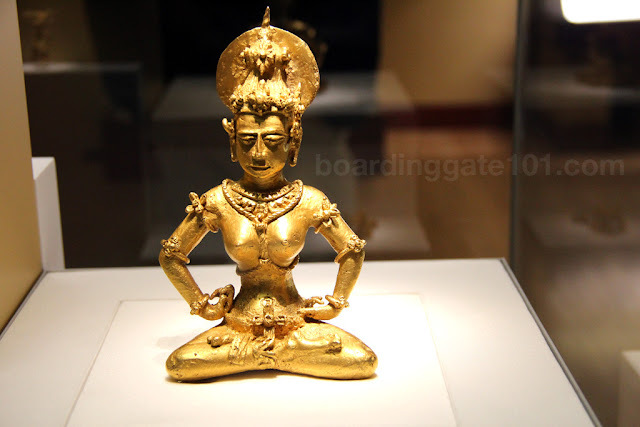 This religious feeling of awe - said to be brought forth by the contact with the deity - is something that I rarely felt. The last time I had the same feeling was seeing Pope John Paul II during the World Youth Day in 1995 in Manila. Maybe it was the solemnity of the mass, which was just concluding when I came in a cold Friday morning. Or maybe the sheer size and grandness of the basilica itself. Or the elaborate mosaic artwork intricately fashioned into the walls and domes of the cathedral, painstakingly done by artisans for decades since they started building basilica in 1914. Or even just the architecture itself that elicits admiration. 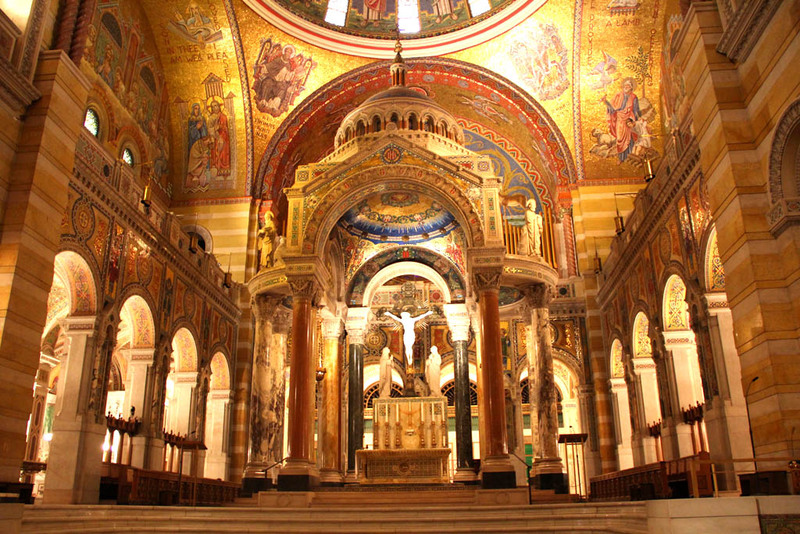 The seat of the archdiocese of St. Louis, Cathedral Basilica broke ground in 1904. Built in Byzantine tradition with Romanesque elements on the exterior, the cathedral was completed in 1914 and was consecrated in 1926. I went there on my last day in St. Louis, before going to the office. When I saw it I regretted right away why I did not visit this landmark the first two times I went to the city. Also known as the New Cathedral, it was meant to replace the Old Basilica located at the bank of the Mississippi. 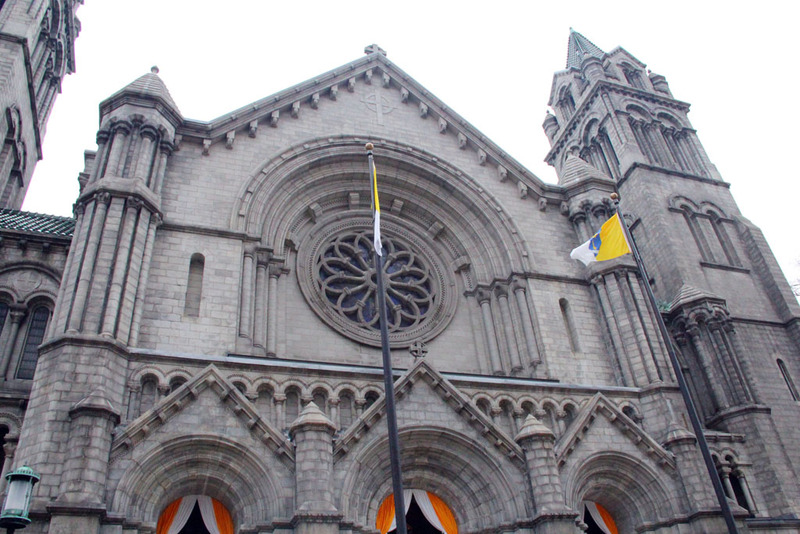 It was designated as a basilica by Pope John Paul II himself, in 1997. The granite-walled basilica has two towers on each side, and a rose window dominating its facade. 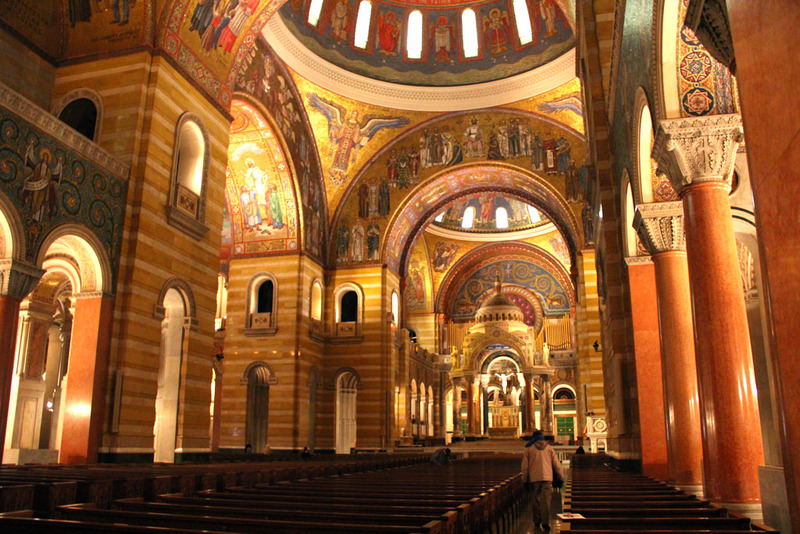 The basilica was laid out with the nave intersected by east and west transepts. Above it are the center dome and two lesser domes. 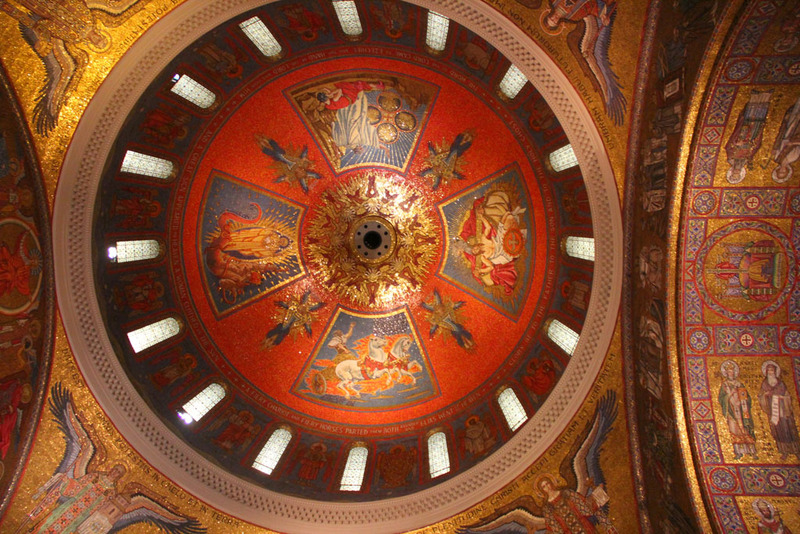 The red central dome, which is 143 feet high, pulls the eyes up and provides a vision of heaven on earth. 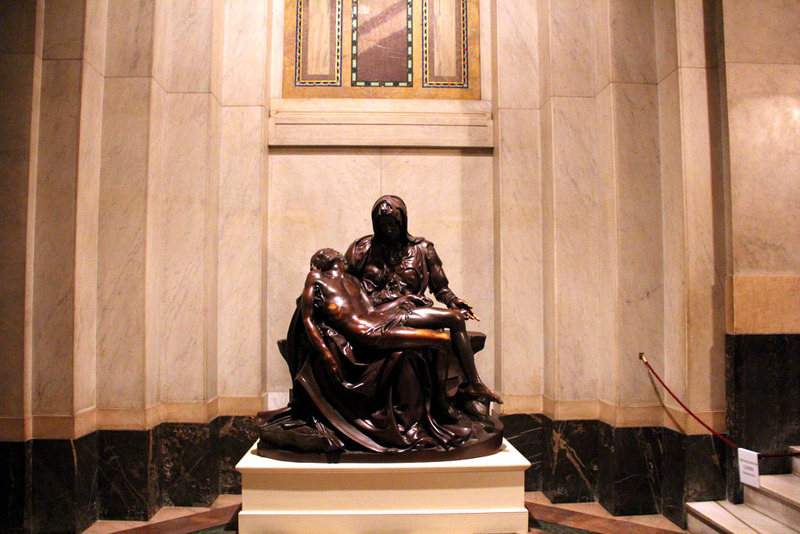 The dome itself is adorned with art by Polish artist Jan Henryk de Rosen, depicted scenes from the Old and New Testament. Aside from its huge domes and soaring arches, the most distinctive feature of the cathedral is the mosaic art installed inside the church - 83,000 square feet in all. Other than the dome, the most impressive part of the church was the altar (pictured on top). The altar, with the image of Christ made of marble at the center, is topped with a baldachino, with the dome similar to the main exterior dome of the church. 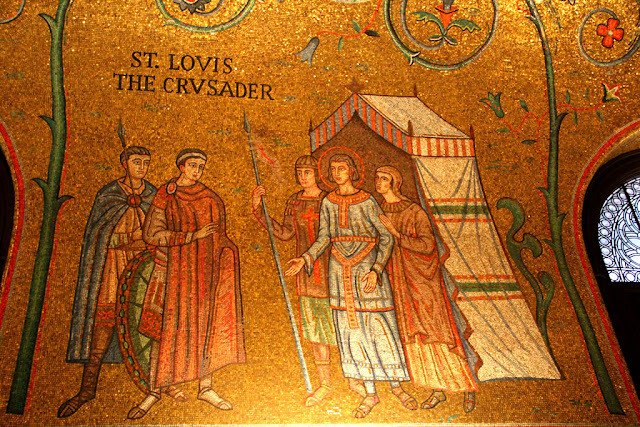 The mosaic installation started in 1914, as soon as the cathedral's construction was finished, but was not completed until 1988. Together, the mosaics contain more than 41.5 million pieces of glass tesserae, in 8,000 colors, making it the largest mosaic collection in the world. The mosaic art were done by different groups of artisans. The mosaic on the chapels and arcades on the west side of the building was done by Tiffany & Co, while the installations on the vestibule and main church were the works of artist Paul Heuduck and his son, Arno, and designed by August Oetken. The mosaic on the narthex depicting King Louis IX's life as a crusader. The green vine symbolizes Christ. On the barrel-vaulted narthex, which is the lobby of the church, the mosaics depict the life of the city's namesake, King Louis IX of France, also done in Byzantine style. The East Transept with the half-dome depicting Christ's resurrection. My visit to the cathedral was a short one. I got there just before a mass was being concluded, and I stayed about an hour after that before I had to head back to the office. Despite of the short stay I think my visit was a fulfilling one. I don't visit churches regularly lately, but it was great that I was able to connect spiritually that time. The Cathedral Basilica of St. Louis is located in affluent section of the city called Central West End, in Lindell Boulevard. The closest Metrolink station is Central West End, at Euclid Avenue and Children's Center. The church is open from 7am to 5 pm. 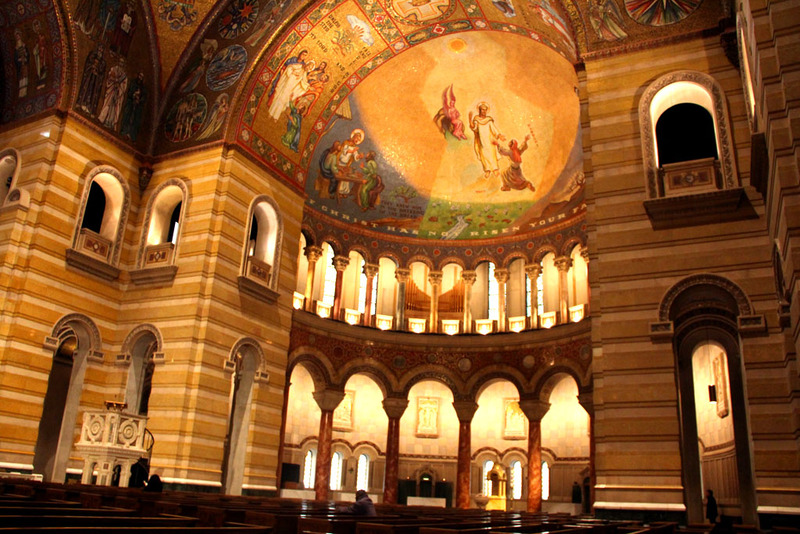 The cathedral also has a Mosaics Museum, located at the lower level of the building. It features the creation and installation of the mosaics. 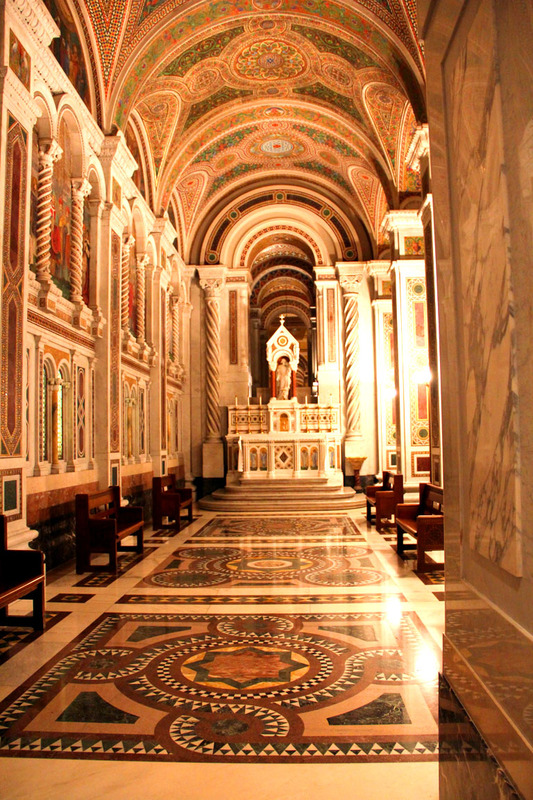 It also has the crypt of the cardinal who initiated the construction of the basilica. 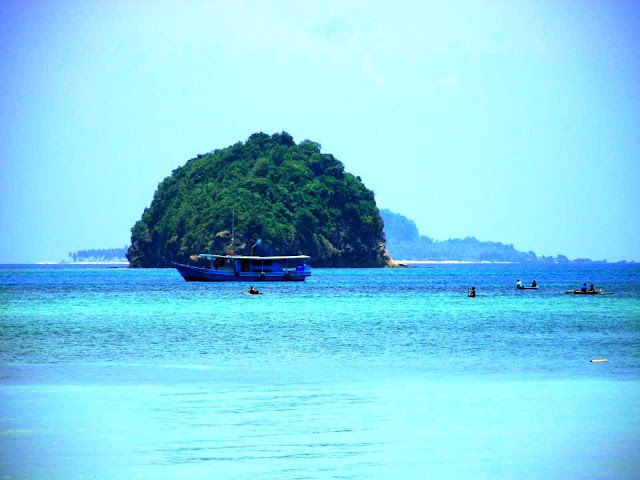 I was not able to visit it as I came early in the morning. The museum is open from 10 am to 4 pm. 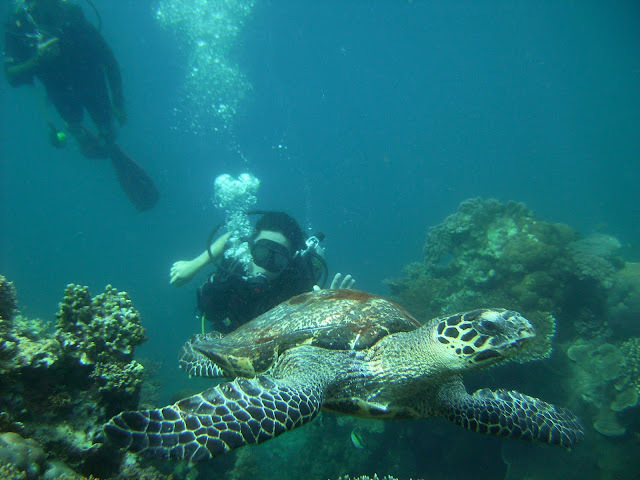 Tours are available on certain days and time. Call 314.373.8242 or visit the website: cathedralstl.com for more info.